Joe E. Brewer, MS, spent most of his career with Westinghouse Electric (now Northrop Grumman Corporation), where he retired in 1998. In 2000, he joined the faculty of the Electrical and Computer Engineering Department of the University of Florida. He was an early contributor to the IEEE Standards for MNOS Arrays and Floating Gate Arrays. He is a Fellow of the IEEE, has authored more than 100 papers, and holds seven U.S. patents. Manzur Gill, PhD, is Chief Advancement Officer and Professor of Physics at Forman Christian College, Lahore, in Pakistan. Dr. Gill has more than twenty-five years of experience in high-tech industry and nonvolatile memory development, has authored over thirty technical publications in international journals, and holds over seventy-five patents. 1 INTRODUCTION TO NONVOLATILE MEMORY (Joe E. Brewer). 1.3 Unique Aspects of Nonvolatile Memory. 1.4 Flash Memory and Flash Cell Variations. 1.5 Semiconductor Device Technology Generations. 2 FLASH MEMORY APPLICATIONS (Gary Forni, Collin Ong, Christine Rice, Ken McKee, and Ronald J. Bauer). 3 MEMORY CIRCUIT TECHNOLOGIES (Giulio G. Marotta, Giovanni Naso, and Giuseppe Savarese). 3.2 Flash Cell Basic Operation. 3.5 Error Correction Coding (ECC). 3.6 Design for Testability (DFT). 3.7 Flash-Specifi c Circuit Techniques. 4 PHYSICS OF FLASH MEMORIES (J. Van Houdt, R. Degraeve, G. Groeseneken, and H. E. Maes). 4.2 Basic Operating Principles and Memory Characteristics. 4.3 Physics of Programming and Erase Mechanisms. 4.4 Physics of Degradation and Disturb Mechanisms. 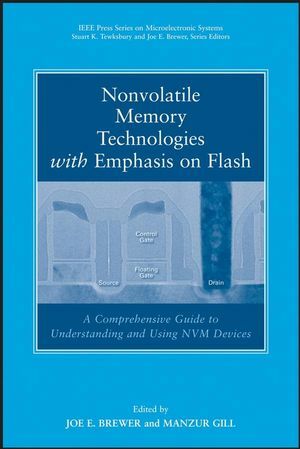 5 NOR FLASH STACKED AND SPLIT-GATE MEMORY TECHNOLOGY (Stephen N. Keeney, Manzur Gill, and David Sweetman). 5.2 ETOX Flash Cell Technology. 5.3 SST SuperFlash EEPROM Cell Technology. 5.4 Reliability Issues and Solutions. 6 NAND FLASH MEMORY TECHNOLOGY (Koji Sakui and Kang-Deog Suh). 6.1 Overview of NAND EEPROM. 6.3 NAND Array Architecture and Operation. 6.4 Program Threshold Control and Program Vt Spread Reduction. 6.5 Process and Scaling Issues. 6.6 Key Circuits and Circuit/Technology Interactions. 7 DINOR FLASH MEMORY TECHNOLOGY (Moriyoshi Nakashima and Natsuo Ajika). 7.2 DINOR Operation and Array Architecture. 7.4 DINOR Circuit for Low-Voltage Operation. 8 P-CHANNEL FLASH MEMORY TECHNOLOGY (Frank Ruei-Ling Lin and Charles Ching-Hsiang Hsu). 8.3 Operations of P-Channel Flash. 8.4 Array Architecture of P-Channel Flash. 8.5 Evolution of P-Channel Flash. 8.6 Processing Technology for P-Channel Flash. 9 EMBEDDED FLASH MEMORY (Chang-Kiang (Clinton) Kuo and Ko-Min Chang). 9.2 Embedded Flash Versus Stand-Alone Flash Memory. 9.3 Embedded Flash Memory Applications. 9.4 Embedded Flash Memory Cells. 9.5 Embedded Flash Memory Design. 10 TUNNEL DIELECTRICS FOR SCALED FLASH MEMORY CELLS (T. P. Ma). 10.2 SiO2 as Tunnel Dielectric—Historical Perspective. 10.3 Early Work on Silicon Nitride as a Tunnel Dielectric. 10.4 Jet-Vapor Deposition Silicon Nitride Deposition. 10.5 Properties of Gate-Quality JVD Silicon Nitride Films. 10.6 Deposited Silicon Nitride as Tunnel Dielectric. 10.7 N-Channel Floating-Gate Device with Deposited Silicon Nitride Tunnel Dielectric. 10.8 P-Channel Floating-Gate Device with Deposited Silicon Nitride Tunnel Dielectric. 10.9 Reliability Concerns Associated with Hot-Hole Injection. 10.10 Tunnel Dielectric for SONOS Cell. 10.11 Prospects for High-K Dielectrics. 10.12 Tunnel Barrier Engineering with Multiple Barriers. 11 FLASH MEMORY RELIABILITY (Jian Justin Chen, Neal R. Mielke, and Chenming Calvin Hu). 11.2 Cycling-Induced Degradations in Flash Memories. 11.3 Flash Memory Data Retention. 11.5 Stress-Induced Tunnel Oxide Leakage Current. 11.6 Special Reliability Issues for Poly-to-Poly Erase and Source-Side Injection Program. 11.7 Process Impacts on Flash Memory Reliability. 11.8 High-Voltage Periphery Transistor Reliability. 11.9 Design and System Impacts on Flash Memory Reliability. 11.10 Flash Memory Reliability Screening and Qualifi cation. 12 MULTILEVEL CELL DIGITAL MEMORIES (Albert Fazio and Mark Bauer). 12.2 Pursuit of Low-Cost Memory. 12.4 View of MLC Today. 12.7 Standard Product Feature Set. 12.8 Further Reading: Multilevel Flash Memory and Technology Scaling. 13 ALTERNATIVE MEMORY TECHNOLOGIES (Gary F. Derbenwick and Joe E. Brewer). 13.2 Limitations of Flash Memory. 13.6 Single-Electron and Few-Electron Memories. 13.7 Resistive and Hybrid CMOS/Nanodevice Memories. 13.8 NOVORAM/FRAM Cell and Architecture.